At Lafuma Mobilier, relaxation and comfort are buzzwords! And it has always been this way. Today, we do not talk about our famous deckchair or our irresistible sun lounger, instead its about our relaxation chair, more commonly called the Relax (with a capital R). Actually, it’s not something to be taken lightly as it represents almost the majority of the 650,000 pieces of outdoor furniture that we produce each year. 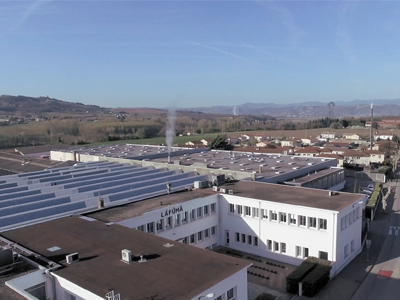 Additionally, in the same way as all of our products, all of our Relax chairs received the Guaranteed Made in France (OFG) certification in 2014. LET'S START AT THE BEGINNING: THE LAFUMA RELAX IS THE ORIGINAL. In 1961 the relax Lafuma was launched, named the Relax Translude. This folding multi-position chair quickly became the essential item for relaxation time, for holidays, just like the camping chair or the camping table. The new range of Lafuma furniture, the result of a tubing/fabric connection taking its inspiration from the famous metal framed rucksack Lafuma, designed in the 1930s explained the slogan of the time: “the furniture for the day of rest”. Jean Lafuma, son of Gabriel, one of the 3 brothers who founded the Lafuma brand, told us in an interview that any person, whether they were sick, elderly or disabled could use the Relax without any problem. In fact the articulation of the frame angle at knee level, more precisely at the popliteal, gives a position which ensures perfect muscle relaxation. And thanks to the replaceable elastic suspension, attaching the fabric to the frame, the Relax offers flexible comfort from head to toe. “This chair is revolutionary, being able to adopt two positions: seated and lying down” he stated. This is how the chair was seen at its launch, and came to know a real golden age of popularity. The year 1971 marked another key date as the brand introduced a second model with a new frame: the Starlax. This frame offered an even easier way to change position, which is why we still use this system today on our Relax.In 1974 a third version was launched. It was the arrival of the Relax Superstar that allowed users to maintain a seated position, but with legs straight out in front, which was known as the “TVposition ”. So it was possible to watch the television while enjoying the incomparable Lafuma comfort. As a little anecdote, in the archives of L’Équipe magazine from the 1970s and 80s, we have found Formula 1 drivers resting in our chairs! It was not until years later, in 2006, that an important innovation emerged with the invention of a patented elastomer clip system, connecting the fabric to the tubing and replacing the traditional laces. The seat is now firmer, thus offering excellent back support, while at the same time guaranteeing a better body weight distribution. The clip also allows a greater ease in cleaning with simple, quick putting on/taking off of the fabric and exceptional durability. In 2011, the development of Air Comfort® technology, a seat pad comprising 3 layers added an extra layer of comfort on our Relax chairs. Over the past 20 years, there have actually been not less than a dozen patents which have been registered and today, more than 130 people work every day on developing the brand’s comfort. The Relax does not seem any older, in fact quite the opposite. Today, the product is lauded by new start-ups which work to bring well-being into businesses or group spaces. With the Relax, it’s possible to unwind at any age! This celebrated lying down position guarantees optimal relaxation. The design was created in close collaboration with the medical profession whose main recommendation was to achieve a position in which the legs are elevated slightly above the heart. «At the time, Dr Pierre Joffard played a very important role. A general specialist, he held a high position in the medical field and had a vast knowledge of hospital organisation and also took care of many elderly people.He was therefore very up to date about the needs in those fields” stated Jean Lafuma. The famous lying down position owes its comfort to the perfect synthesis of the two angles, 127° and 133°.It saves any muscular and extra effort and ensures absolute bodily comfort, which is the tangible proof of the brand’s knowledge and experience. Did you know? 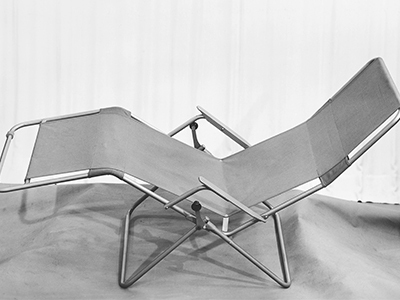 Lafuma Mobilier was the first to have applied this position to a relaxation chair. Well before the 1970s, when NASA popularised it under the name “Zero Gravity”, as it is the position that the body takes naturally when weightless. It’s unbelievable, isn’t it? In our world where “everything passes by too fast”, relaxing and recuperating are headlines more than ever. Our chairs are the perfect response to your quest for well-being. In addition, at the 2017 Made in France Exhibition in Paris, we set up a “ Relax Zone” in order to allow visitors and exhibitors to experience the incomparable comfort of our Relax. We found more than one person taking a nap and a little waiting line began to form. It is for this reason that its use can be very varied, for sportsmen and women wanting to rest after a workout, with medical professionals such as reflexologists. The product is also perfectly at home in companies’ relaxation zones, for the benefit of their employees, a concept which is increasingly in the news. Back in the day, Jean Lafuma explained to us that “he happened to quietly rest in a relax after lunch, but we were not to repeat it as this was not viewed as indulgently then as it might be today! The Relax that we invented in 1961 has learned to evolve through different generations and trends. All the time remaining faithful to its original qualities - strength, lightness and comfort - we have been able to update it and make it an essential piece. 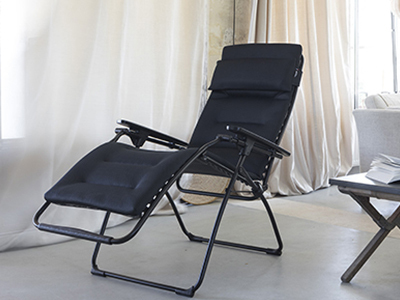 Today, you will definitely find the perfect relax chair among the various existing models (including an XL version for those with a larger build) and it will therefore form an integral part of your outdoor living. And for those seeking comfort, you will be happy to choose the mattress topper from Air Comfort. 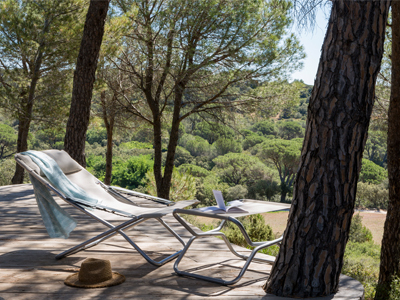 Whether it is in your garden, on the beach, on the patio or indoors, bear in mind that our Relax will go anywhere. It will therefore go with you, throughout your life. Optimal relaxation assured!